My collection started in 1983, the year I graduated from high school, the week my mother died. I'd gone to the house where it happened, 1307 Bellgrove Avenue in Seabrook, Texas. I'd moved out of this home six months prior, to start my own life. Returning to gather things to remember her by was difficult. The day her body was found police asked me over the phone, "Do you want to see her?" But I couldn't. She'd been dead for more than twelve hours, her body already rigid. My imagination had already provided sufficient unwanted images. I didn't want to see her that way. When I returned to collect a few things the following week, I feared the police and coroner had left some remnant of that horrible event, perhaps part of the sandwich she hadn't finished, the glass of curdled milk or dried vomit on the chair. It would be hard enough to view this recliner my stepfather had insisted on keeping, her chair. I suppressed my fear and returned to the scene. I moved toward the bookshelves behind the favorite chair where she'd been found. My eye went straight to a prescription drug reference book. I picked it up, saw that she had redlined the information on the drug that killed her. I took a handful of other books, one by Dr. Wayne Dyer, Your Erroneous Zones, and another by Erma Bombeck, If Life Is A Bowl Of Cherries, What Am I Doing In The Pits?. I avoided looking at the recliner. In her dust-free bedroom I found favorite perfumes neatly aligned on a white dressing table -- Cache', White Diamonds and Este'. On the master bathroom counter was a blue elastic headband once used to hold back her hair as she applied Merle Norman foundation, loose powder, and her Cover Girl signature green or blue eyeshadow. There was a clear plastic hand mirror, a green bristle brush, a black ratting comb, a tall can of VO5 hairspray. I opened the medicine cabinet, noticed immediately the empty prescription bottle once containing the tricyclic antidepressant, Amitriptyline. I closed the cabinet, picked up the blue headband and moved to her closet. Her clothing still smelled like White Diamonds. To be close to her, I gathered my arms around several colorful blouses, buried my face in handfuls of soft perfumed fabric, and sobbed. I'd held it together until that moment. I pulled two of her favorite shirts from their hangers and folded them neatly, closed the closet door. I moved back to the white dresser to collect a teddy bear pin I'd passed over earlier. It was part of a pair, similar to one I had at home. She'd bought these for us only two weeks earlier, asking, "Which one do you want?" Now they could be together. Thirty-two years later I still have these items. 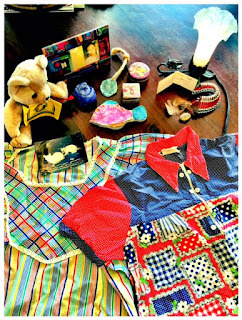 I studied them the other day, noticing for the first time that the shirts came from JC Penney, one blouse hippy, the other Holly Hobby. I could envision my mother wearing them, her cat-like elegance gliding from room to room in the Bellgrove house, down the narrow hall away from me, her head held high to conceal the chronic terror she numbed by self-medicating, overindulging, sacrificing her own power. There are other saved items unrelated to my mother. There's a stuffed bear commemorating a fundraiser for AIDS research; this in honor of my friend, Dr. R, who died of the disease in 1996. There are small clay pieces crafted by my now grown son, perhaps to represent a childhood lost. His lost teeth and those of his older sister are kept in colorful bamboo boxes lined with red silk. There are two photographs, one of deceased cats, Max and Madison, and the other of a Vietnamese woman I never knew. A friend took the photo in the mid-'90s during a trip to Vietnam. When he showed me his photo album, I found this particular picture so mesmerizing, haunting, the brightness of a yellow doorway and her gracious smile belying the weariness in her eyes. He said I could keep it. The photo is in a jewel-toned frame which was a gift from Deedee, my best friend for eighteen years. Deedee died in a car accident in Friendswood, Texas, 1998. For her I keep a small Indian headdress she made from safety pins, red and black beads, strips of leather and weightless gray feathers; a rock totem of a snake representing birth, death and regeneration; a card once attached to a friendship music box which reads: Your [sic] right there, a private nod to our soulful connection; a purple calla lily lamp with a bronze frog at the base. The lamp, like my mother's bear pins, was a pair, one for her, one for me. A few years ago my youngest daughter came home with a Spanish assignment to celebrate Dia De Los Muertos. I asked if she wanted to honor the grandmother she lost twenty-three years before her birth, so she did. She decorated a small square box with a photo of my mother, brightly patterned tape and colorful glass stones, then we added cut tissue paper, dried flowers and other personalized essentials: a Butterfingers candy bar, a copy of my mother's favorite Serenity Prayer, a brief description of this lovely 5'2" woman who wrote songs and poetry and who, for as long as I can remember, took in countless stray dogs and people. The following year my daughter honored my brother, David. In his box we placed photographs of Bruce Lee, hot sauce, nunchucks and a photo of the Beatles album, Sgt. Peppers Lonely Hearts Club Band. Since learning more about his life, I would add photographs of the Mojave Dessert, its Joshua Trees and creosote bushes, the slate strips of endless highway cutting through a land of contrasting succulence and barrenness. These remembrance boxes are kept with the other items I've saved for decades, with dozens of photo albums and journals, crates of baby and childhood mementos from each of my four children. These tangible objects help me remember the dead, recall lost childhoods, summon ephemera. They are physical reminders of the people and things, times and places I have loved. Once in a while I need to touch that love, to steady my heart and the sputtering reels of memory.